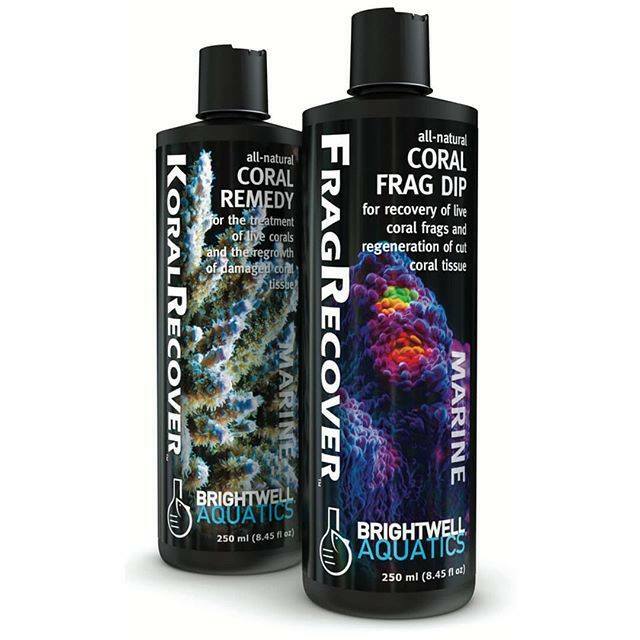 All-natural herbal frag dip to accelerate coral recovery and growth after fragging. Safe for all coral varieties: soft, LPS, and SPS. All-natural herbal treatment for symptoms affecting live hard and soft corals in marine aquariums. Treats a number of symptoms of coral disease such as RTN, STN, White Band, Black Band, Brown Jelly, and White Paste. Stimulates regrowth of lost coral tissue that occurs due to disease, fragging, and/or stress. Safe for all coral varieties, clams, anemones, sponges, invertebrates (including shrimp), and fish (including sharks, rays, gobies, seahorses, and eels). Also safe for calcareous and microalgae. Visit www.BrightwellAquatics.com to view the full line of Brightwell aquarium products.